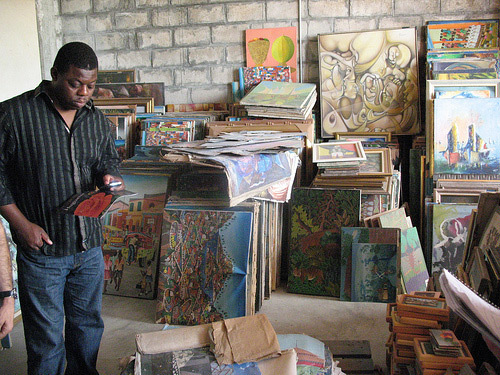 The Smithsonian is leading a team of cultural organizations to help the Haitian government assess, recover and restore Haiti’s cultural materials damaged by the devastating Jan. 12 earthquake. 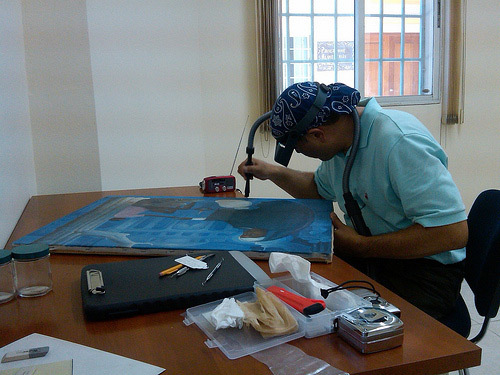 Hugh Shockey, objects conservator at the American Art Museum, is traveling in Haiti with other Smithsonian staff, helping to recover objects displaced by the earthquake. Another exciting and action-packed day. Hitoshi departed today, but worked until he had to leave for the airport, at which time it was necessary to pry him away from tweaking his inpainting so that he would not miss his flight. As Hitoshi left, Vicki Lee and I hopped in the car with the driver and Carmelita Douby for a shopping excursion in Petionville. While shopping might seem like a recreational activity, this sort of shopping is essential. Shopping and supplies are organized differently in Haiti, so we needed to see what shops had what kinds of supplies so we could determine what is actually available on the island. The shopping trip was very useful and we were able to pick up many things needed now for the labs as well as identify supplies that will be needed later. This also will be useful in preparation for the upcoming ICCOM training. The more things we can find on the island, the better. Making conservation in Haiti sustainable is the ideal since since shipping everything in from outside is both expensive and time-consuming. To give you an example of how long it takes to get things, a simple task lamp would take 20 days on order from the local office supply store. To view some common tools used in conservation, for which Hugh and the team are searching, visit the Lunder Conservation Center’s website. It is Sunday and the day was filled with excitement, particularly for Hitoshi Kimura. Yesterday, we finally picked up the first objects to be treated at the Center and by the end of the day we had logged five paintings into registration storage. Today Hitoshi started working on one of the paintings in earnest. 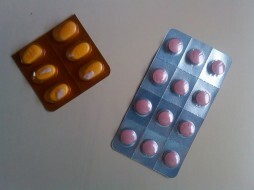 He began with documentation, of course, then moved on to active treatment. This began with vacuuming all the surfaces of the painting, then repairing tears, filling losses in the paint layer, and inpainting the damage so it appears that nothing has happened. While Hitoshi worked feverishly on the painting the rest of the conservators (Vicki Lee and I) worked to clean all the surfaces in the lab spaces in anticipation of receiving more works for treatment in the coming week. 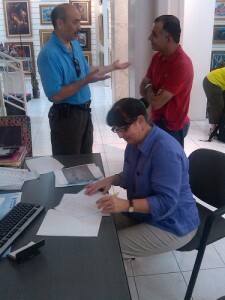 Our colleague, Gail Joice from the American Indian Museum, left us today headed back to the United States. Watch a video pf painting treatment, including some of the techniques Hugh mentions. Today was a very exciting day for the conservators—we have objects in the lab! Woo hoo! The day started with a trip the Marianne Lehmann Vodou Collection and Foundation to allow the ICCROM representatives to assess the collection so that its needs could be integrated into the training program development. The UNESCO cultural representative also accompanied us. We had lunch with the ICCROM and UNESCO representatives as a wrap-up to the collaborative morning visit. We then returned to Galerie Nader where we helped Mr. Nader pack the first five damaged paintings to be transported from the museum to the Center. Needless to say, all the conservators left the Center buzzed at actually having something to work on tomorrow. Tomorrow is Sunday, but yes, we are working every day. Today was a very significant day. It was meeting day—big meeting day. Many of the collection representatives, Center staff, ICCROM representatives and conservation team members met to discuss the expectations for Haitian collections and the direction of the Center for training and conservation work. The meeting was necessarily long—about three hours. This meeting was extremely important to make all of the potential users of the Center’s services aware of what would be available and to reassure the holders of Haitian culture that we are here to do and not just to talk. The conservators spent the rest of the day creating and modifying existing object intake forms to assist the registrar in getting the Center’s object file system up and operational so that as conservators rotate in and out of the Center, treatment documentation could keep some degree of continuity. We also had a brief shopping excursion to learn what sort of supplies are readily available that can be adapted for conservation use. Today was a very busy day and, thanks to the curative powers of medication and sleep, the team was ready to meet the schedule. We left the hotel around 7:30 a.m. and arrived at the Center around 8 a.m. We began the morning talking with the ICCOM representatives about the collections that had been surveyed during the teams’ first assessment trip and how these collections could be integrated into the training so that it is practical and relevant to the conditions in Haiti. The entire group then met with UNESCO cultural representative Elke Selter to discuss how the Center could collaborate with UNESCO’s objectives in Haiti. In order to give both the ICCROM and UNESCO representatives an idea of the scale of the needed conservation effort, we hit the road and visited Galerie Nader, the Centre d’Art Haitien and ended the tour at Cathédrale Sainte Trinité to view the murals. I was impressed to see that the rubble in the sanctuary of the church had been mostly removed and the tile floor was visible. Everyone in the group felt a great urgency about the murals as it was apparent that the rains, despite the tarp covering covering the murals, had caused water to run down them, depositing a whitish haze on the surface. 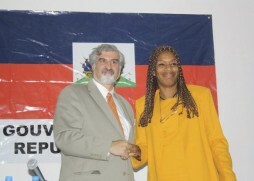 Richard Kurin, left, the Smithsonian's Under Secretary for History, Art and Culture, shakes hands in agreement with Minister of Culture Marie-Laurence Jocelyn Lassègue to preserve Haiti's cultural heritage. The group also had the honor of meeting with the Minister of Culture Marie-Laurence Jocelyn Lassègue to update her on the Center’s progress and allow the ICCOM representatives to elaborate on what they hoped to contribute to their effort to train Haitians at the center. Tomorrow we hope to have most of the registration and treatment approval paperwork ready to go and look forward to getting objects to the Center in order to treat them. It is really becoming a reality, folks. Well today was a very difficult day. The entire team woke up ill. Everyone had been up all night with “gastric distress”—even when you think the food is safe it may not be. 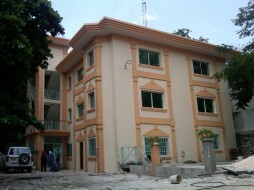 I was ill enough that I couldn’t make the morning site visits and spent the morning trying to get down sips of soda and sleeping after taking a Cipro. It is, of course, always important to pack serious medication when traveling to a place like Haiti since neither a physician nor a pharmacy may be readily available. I was able to rally by around 1 p.m. and switched out with another member of the team who had hit a wall during the day, most likely from dehydration and being in the heat. When I arrived at the Center the others were at lunch, so I used the time to divide up and organize some to the supplies for the objects lab. When everyone returned we had a brief meeting with the two ICCROM (pronounced Ekrom) representatives, Baba Keita and Aparna Tandon, regarding the goals and expectations of the initial training program at the Center. ICCROM has extensive experience facilitating conservation and preservation training around the world and has instructors and training materials in French (for those that might have forgotten, Haiti is a francophone country) ready to go. Gail Joice also joined us today. She is a French-speaking collections care specialist from the American Indian Museum who is here to help establish a registration system for the Center. Following this meeting we met as a group with Patrick Vilaire. Mr. Vilaire is a sculptor, is very knowledgeable about Haitian cultural history, and took personal initiative to preserve culturally significant locations around Port au Prince. 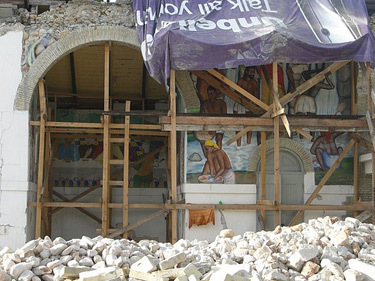 The meeting ranged across a variety of topics including the identification of cultural material most at risk, preservation of intangible culture, such as Haitian Vodou practice, and what can be done about the murals at the church of the Holy Trinity. The meeting ended around 7:30 p.m. and we headed back to the hotel. Tomorrow we will be visiting the Holy Trinity church site so that Hitochi (the team painting conservator) and the ICCROM members can assess the site. 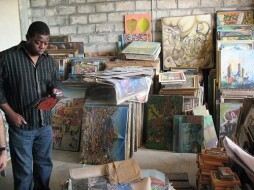 To see a film about Haitian sculptor Patrick Vilaire, click here. Up at 6 a.m. to get ready for the day. Breakfast at seven and ready to leave for the Center at eight. We started the day at the Center by unpacking bags and taking inventory to confirm that everything made it to Haiti and thankfully, it did. 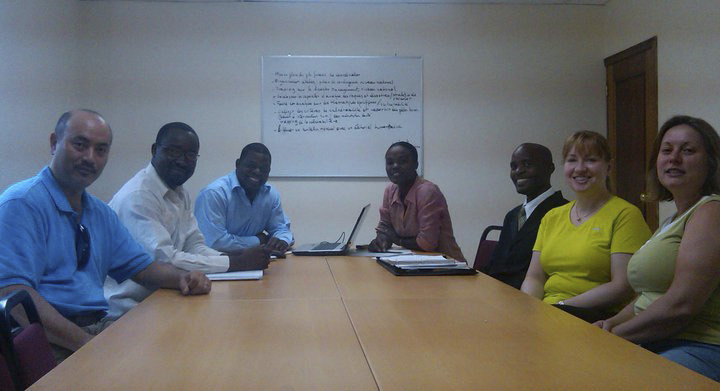 We had a short meeting with the ever-growing Center staff. The U.S. team members and our Haitian counterparts are pictured from left to right: Hitoshi Kimura, American Institute for Conservation of Historic & Artistic Works (AIC-CERT); Fritz Berg Jeannot, training coordinator; Olsen Jean Julien, Center and project manager; Misly Michel administrative assistant; Jean Baptiste Mentor, office manager; Cori Wegener, U.S. committee of the Blue Shield; and Vicki Lee, Maryland State Archives, AIC-CERT. After the meeting we divided up the supplies and equipment between the labs. We took a lunch break back at the hotel and are waiting for colleagues from ICCROM to arrive this afternoon for an evening meeting to begin discussing strategy. Tomorrow we will be visiting collections that we did not get to see on the first trip. More on this tomorrow. The day started early, awake at 5:45 a.m., convening in the hotel lobby with bags, bags and more bags at 6:45. The first bit of difficulty started at the airport. Despite the information on its website, the airline changed its checked baggage policy to no more than two bags per customer. That left us in a crunch, as we each had three bags and were prepared to pay the baggage fee. 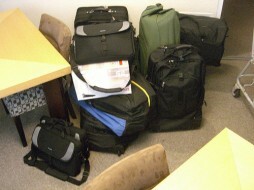 Luckily, with some explanation, the desk manager gave us an exemption so we were able to get the bags checked. Our Haitian contact, Olsen Jean Julian, was at the airport to meet us and called in a favor with the Ministry of Foreign Affairs to help expedite our trip through immigration and security. We got the bags loaded into two SUVs (just as an FYI, we noticed that the temperature display on the truck’s console read 91 degrees Fahrenheit) and took off to the conservation center. It was midday and high traffic time in Port au Prince so the trip took about an hour. We unloaded and went to lunch. Over the long lunch we discussed the plan of action for Tuesday that included picking up colleagues from the International Centre for the Study of the Preservation and Restoration of Cultural Property who would be assessing what training was wanted by the Haitians. After lunch, we went back to the center and moved the bags upstairs so they would be ready to unpack and inventory. We left the center at about 4 p.m. to check into the hotel, unpack, eat and get ready for tomorrow. Four o’clock may seem early, but remember that Haiti is near the equator so it is daylight for about 12 hours and it starts to get dark at 5:30 to 6:00 p.m. The streets of Port au Prince are no place to be (even in a vehicle) after dark. Still in the U.S. but the work has begun in earnest. From 4:30 p.m. till about 8:30 p.m. four of us began unpacking and repacking materials and equipment that have been purchased for the Haiti center. Even this beginning required a bit of creativity. We are hauling all of the materials and equipment as checked luggage and carry-ons, so how do you get the most stuff into bags that meet the requirements to fly? First, ID what is the most important to get to the center, then pack and repack and add until it all fits. I think we ended up with seven or eight bags and a box. The images I’ll be sending give you an idea. The morning tomorrow starts at 6:45 a.m.—meeting in the lobby with all the bags headed for the airport. Extra and overweight baggage fees are expected. Although we might be the most expensive delivery service (what with airfare, fees, etc. ), as my colleague Cori Wegener puts it, we also are 100 percent reliable. Cori is president of the U.S. Committee of the Blue Shield as well as an associate curator at the Minneapolis Institute of Arts. Fingers crossed that we don’t run into much trouble with customs when we get to Haiti. The Ministry of Culture is supposed to meet us to help the process. As an FYI, anyone thinking of heading to Haiti should know that immigration, baggage claim and customs are located in a metal-roofed and walled building with no air conditioning or fans to move the air around; with any luck, you are out of there in about an hour. More tomorrow when we’ll be on the ground in Haiti—hopefully with all of the stuff we are bringing. (This article was originally posted on the American Art Museum’s Facebook page. More photos can be found on SAAM’s Flickr photostream and be sure not to miss the upcoming exhibition, The Healing Power of Art: Works of Art by Haitian Children after the Earthquake, at the Smithsonian’s S. Dillon Ripley Center, June 17 – October 17.